* The transaction fee is £0.00 for E-ticket (Print-at-home) or £1.50 for Standard Delivery. Please call SEE Tickets on 0115 896 0154 if you would like to book a ticket by phone or have any questions when booking your tickets. NB: Postable tickets will be dispatched from 1 month prior to the opening show date. Please use postcode CV31 1XN to arrive at venue and then follow road directional signage. Main visitor car park entrance is off the Southam Road the A425. There is no entry to visitors on the Fosse Way (B4455) entrance. Last Admission strictly 1 hour before closing time. 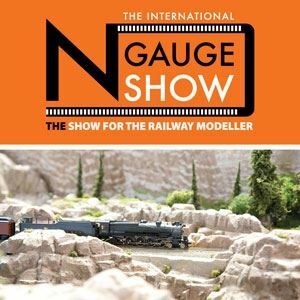 This major two day show is dedicated to N GAUGE and is THE show not to be missed. There will be over 30 layouts on display depicting Modern, Steam, American, and Continental layouts, as well as 5 of the leading societies for N Gauge enthusiasts. Over 40 specialist suppliers will be present, showcasing all the latest models and products, making it THE place to visit and stock up on all the models and materials any model rail enthusiast could ever need. This is a hugely popular specialist railway exhibition and totally focuses on N Gauge. Nowhere else can you see and enjoy the N Gauge scale in such volumes of either layouts or exhibitors making it the only place to see all things N Gauge.